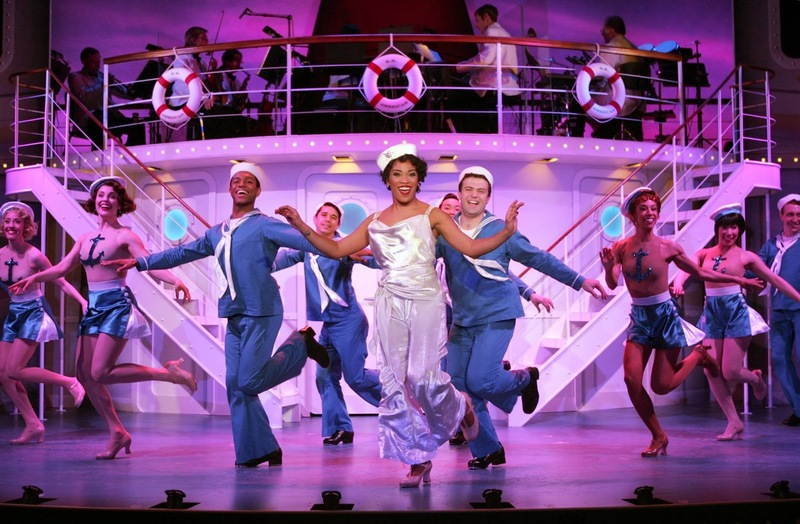 Delightful Cole Porter melodies, humorous hi-jinx and stage-thundering tap dancing make Anything Goes a perfect fit for the stage at Goodspeed’s Opera House. This type of old-fashioned dance musical is what the theater does best and the current production, directed by Daniel Goldstein, who directed Godspell on Broadway and Damn Yankees and Hello, Dolly! at Goodspeed, is delovely fun. The action begins when Billy Crocker (David Harris) decides to skip work and stowaway on a ship taking the girl of his dreams, socialite Hope Harcourt (Hannah Florence), away to marry dorky Sir Evelyn Oakleigh (a delightful and delovely Benjamin Howes) , whose fortune makes him the man of choice for Hope’s mother, Mrs. Wadsworth T. Harcourt (Denise Lute) . Meanwhile, Billy is pursued by club entertainer “evangelist” Reeno Sweeney (Rashidra Scott) and later, by the authorities, when he is mistaken for Public Enemy Number One. Throw into the mix the real Public Enemy Number 13, Moonface Martin (Stephen DeRosa), his partner in crime, sailor-happy Erma (Desiree Davar) and Elisha J. Whitney (Kingsley Leggs), Billys boss who shows up on board ship wondering why Billy isn’t at work and you have a recipe for romance, comedy and fun. DeRosa gets the most laughs with his silly gangster character among other things, masquerading as a craps-playing priest leading two Chinese followers astray (and at one point, he appeared to get Harris laughing out of character). Don’t worry too much about that plot (the original silly book was written by Guy Bolton, P.G. Wodehouse, Howard Lindsay, and Russel Crouse and has been updated by Timothy Crouse and John Weidman), or the fact that Goldstein’s direction doesn’t achieve a blending of the stories or chemistry among the actors. Apparently, anything goes. Focus instead on enjoying the wonderful Cole Porter tunes like "I Get a Kick Out of You," “Friendship,” "You're the Top," "Blow, Gabriel, Blow" “Easy to Love,” and the title song among others, Music Directed by Michael O’Flaherty (assisted by William J. Thomas) with Orchestrations by Dan DeLange. All of that glorious music is put into motion by choreographer Kelli Barclay, no stranger to Goodspeed where she choreographed Damn Yankees; Hello, Dolly! 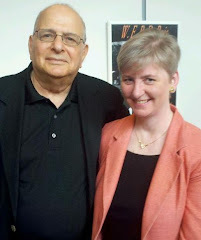 ; My One And Only; and How to Succeed in Business Without Really Trying. She knows how to get the huge ensemble across the stage looking like they are doing more than they really are – that Goodspeed stage is pretty small. She engineers some thundering tap-dance numbers that are real crowd pleasers. Also entertaining our eyes are Ilona Somogyi’s costumes which range from sailor garb to more risque show-girl outfits to beautiful, shiny evening gowns (with Hair and Wig Design by Mark Adam Rampmeyer) and Wilson's Chin's ocean-liner set. 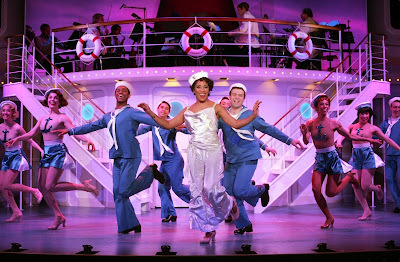 Anything Goes taps across the stage through June 16 at the Goodspeed Opera House, 6 Main St., East Haddam, Performances are Wednesday at 2 and 7:30 pm; Thursday at 7:30 pm. (with select performances at 2 pm), Friday at 8 pm; Saturday at 3 and 8 pm; Sunday at 2 pm (with select performances at 6:30 pm. Tickets $39-$84 (860) 873-8668; www.goodspeed.org. Enjoy a discussion of this show, which opened in 1934 and was the the fourth longest-running musical of the 1930s despite the Great Depression, with members of the cast after the Thursday evening performances on May 5, 19 and June 2. Meet the Cast events are free with a ticket to that evening’s performance. Add a leisurely cruise and sumptuous buffet aboard the Lady Katharine to your theater ticket Thursday, June 16. Choose an 11 am lunch cruise ($43) or a 4:30 pm dinner cruise ($48) to pair with your ticket to either the 2 pm or 7:30 pm performance. Student Rush: $15 tickets with valid student ID available beginning at 10 am on any Wednesday, Thursday, or Friday, Saturday, or Sunday for that evening's performance. Friday Dinner Theater Package includes dinner at the Gelston House (located next door to The Goodspeed) and a ticket to the 8 pm performance. Includes your choice of beef, chicken, fish, or pasta entrée - $84.